Do you have an offer code? Invalid Coupon Applied! We'll provide you with a full refund if you drop out within 7 days of starting your program. If you choose to drop out later, you will receive a pro-rated refund based on the number of days you've spent in the program, minus a non-refundable fee of $250. Don't hesitate to contact us. 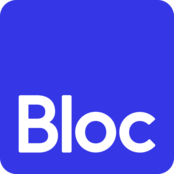 Call (650) 530-6427 or email hello@bloc.io with any questions or concerns. Bloc is an intensive program. Commit to Bloc and we will help you learn new skills and change your career. I understand learning new subject matter is difficult, and I will trust the process and the Bloc community. I understand this program will not be easy. I will face challenges and I will get stuck. I will try my hardest to get unstuck on my own. And if I can't get unstuck, I will reach out to my mentor for help. I am determined and inspired to learn.